Breakthrough is the winner of the 2001 8x8 Game Design Competition. The rules of Breakthrough (see link above) are simple. 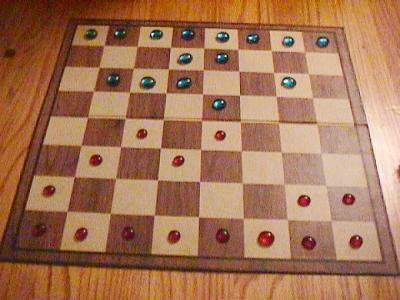 It is played on a standard 8x8 chessboard. Each player has two rows of pieces where Chess pieces would ordinarily go. Apart from distinction in colour between the players, all pieces are the same. Each piece moves one square straight or diagonally forward to an empty square, or captures by displacement, moving one square diagonally forward. The first player to move a piece to their opponent's back row wins. That's it! Very simple rules, but reputed to be deep.